And what else is there to say about Woodrow Dantzler? As one of the most publicized athletes in Clemson history, his accomplishments have been well chronicled. There’s his quest for 2,000/1,000, the incredible number of records set and the SportsCenter-worthy highlights he provides on a seemingly weekly basis. The amazing stuff began in his sophomore season against North Carolina. Dantzler came in for an injured Brandon Streeter and led the Tigers to victory thanks to his 56-yard touchdown run in the fourth quarter in which he tiptoed the sideline and outraced the Tar Heel defense. He set his first record later that year against Maryland when he broke Bobby Gage’s single game total offense mark, which had stood for 52 years. Dantzler was 16 for 23 passing for 252 yards and rushed the ball 22 times for 183 yards in a touchdown for a total of 435 yards. As the full-time starter his junior season, Dantzler shined. He reeled off electrifying touchdown runs of 75 and 45 yards as a part of his 220-yard rushing performance against Virginia, an ACC record for yards rushing by a quarterback. He reeled off four straight games of 100 yards rushing and 300 yards of total offense, a first in college football. He was on pace to become the first player in college football history to throw for 2,000 yards and run for 1,000 yards in one season until an ankle injury slowed him down. He will always be remembered as the guy who threw the ball for Rod Gardner’s game-winning catch against South Carolina in the Tigers’ 16-14 win. He has broken records for rushing yards by a quarterback, career total offense, single game and career touchdown responsibility this season and now owns 30 Clemson records. He is within reach of a few more before his career is over. Over his career Dantzler has received numerous honors. In 2000, he was one of eight semifinalists for the Davey O’Brien Award and one of 15 semifinalists for national Offensive Player of the Year by Football News. He has been named player of the week at some point in his career by USAToday.com, CNNSI.com, the ACC, The Sporting News and Jefferson Pilot. He was named the 2001 midseason MVP of college football by CBS.Sportsline.com. But it all started with a humble beginning. Dantzler came to Clemson as a highly recruited football player from Orangeburg-Wilkinson High School, where he passed for 7,113 yards and ran for 3,134 yards in his three-year career. Although he was recruited by every major school, there were plenty of doubters when it came to his passing ability. Most wanted Dantzler to play another position, but he chose Clemson and with it the chance to play quarterback. He redshirted his freshman season and finally saw the playing field in 1998 against Furman. His debut was a remarkable one in which he orchestrated the second longest drive in Clemson history, an 18-play, 8:49 marathon that consisted of Dantzler runs almost exclusively. Some of the fans in the stands wondered if he could throw the ball, but Dantzler never doubted himself. Dantzler would go on to prove his critics wrong. 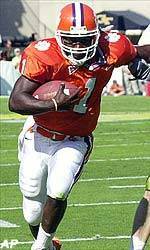 In his first start of the 2000 season, Dantzler completed 16 of 17 passes against The Citadel to set Clemson records for completion percentage and passing efficiency with a minimum of 15 attempts. He scorched N.C. State this year with 333 yards through the air while completing 23 of 27 passes, a completion percentage record given 20 attempts. Woody Dantzler has answered every challenge he has been presented with at Clemson, just as he has been answering them all of his life. Growing up as the youngest of Mozelle and Woodrow Dantzler, Jr., Woody was always the hyperactive child getting his hands into everything. A good student, Dantzler always finished his work earlier than his classmates and got scolded by teachers when he would proceed to talk to the other kids or try to distract him. Once he tried to use a wrestling move he had seen on TV on one of his older sisters before his mother stopped him and told him he should never hit girls. Sometimes Woody’s endless energy translated into stealing here and there and running errands for some of his friends. The problem is that these friends liked to hang out at the house across the street, an old run-down house. But with the help of his family, Woody was able to avoid the fast life and redirect his energy to something positive. “Thank goodness I had two loving parents who were not afraid to let me know when I was wrong,” Dantzler said in a paper written for the NCAA Foundation Leadership Conference he participated in during the summer of 2000. “I finally came to realize that this type of life was going to lead to one of two places, jail or six feet deep. I didn’t want to be another statistic so I chose to make something of my life.” Dantzler’s father decided to take him to a karate class one day and young Woodrow loved it. Finally, a chance to hit someone without getting in trouble. Before concentrating on football full-time Woody got up to brown belt and lost only one match. Actually, he defaulted because he refused to fight the girl opponent, remembering his mother’s decree in his childhood that he should never hit a girl. Many Tiger fans and opponents know Woodrow Dantzler the football player, but few know Woodrow Dantzler the person. He is often guarded in interviews with the media and would much rather talk about what a great job his teammates do than talk about himself. In fact, Dantzler wouldn’t agree to a Heisman Trophy campaign unless his offensive linemen were included. He is the undisputed team leader. He is a big kid, the locker room prankster who watches the cartoon Dragon Ball Z in his free time. He loves kids and when his football career is over, he wants to do something to help them. Early in his college career, Dantzler’s dream was to create jobs for others by opening a chain of sporting goods stores. He now wants to create a diversion for kids to steer them away from places like the crack house that sat across from his home in Orangeburg. Dantzler got a taste of what running a kids center would be like this summer when he served as a counselor at the YMCA Foothills Area Family summer camp. He watched over eight preschoolers that just might have had as much energy as he did, and Dantzler enjoyed every minute of it. “I love working with them,” he said. “They are special people.” Family and football have both helped Woodrow Dantzler III become a successful all-around person, but he credits one more major influence. Of all his runs and passes, yards and touchdowns, titles and awards, Dantzler names none of them as what stands out in his life. “Giving my life to Christ,” Dantzler said, is his biggest play. Even as he was suffering from a rare blood disease, Woody’s father reminded his son that God had a plan for everyone. Woody never forgot his father’s words and credits God for blessing him with such loving family and friends. He credits God for helping his father live despite having a blood pressure of 60 over 0 at one point. It’s one reason Dantzler believes he can do anything he puts his mind to. “With God for you, who can be against you?” he said. As Dantzler rides off in to the sunset of a fabulous career, it’s clear his name will never be far from the minds of the Clemson community. Louis Garmendia is from Mt. Pleasant, SC and is a graduate student in the Clemson Sports Information Office.